The first solo album by Neil Young was the self-titled Neil Young and was released in December 1968. This was after Neil Young had quit his former band Buffalo Springfield. Neil produced it together with David Briggs and also Jack Nitzsche and Ry Cooder. The recording was done in Neil Young's house in Topanga Canyon. The album includes two instrumental tracks: "The Emperor of Wyoming" and “String Quartet from Whiskey Boot Hill" (the last composed by Jack Nitzsche) which are opening tracks on both sides. “The Loner” was the first single from the album. Even that Neil Young doesn’t contain what can be called hits there are many great songs here. The almost six minutes long "The Old Laughing Lady" is touching in its slow and dim manner and "Here We Are in the Years" are beautiful and besides its originality seems to be influenced The Beatles. Another song that stands out on the album is "The Last Trip to Tulsa". This long song contains a rather suggestive tale that shows Neil Young's ability as a storyteller and makes clear that this is a quite unique singer-songwriter. 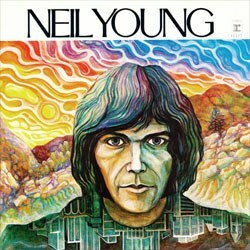 Neil Young was far from pleased with his solo debut, and the issue for his disappointment was primarily the production. He has later said that he regrets that he overdubbed the songs when he should have left them untouched. The production is not in top-class and sometimes makes the sound kind of claustrophobic. Especially vivid is Young's sense of melancholy and the ingenious clusters of images he employs in his lyrics. The psychedelic cover was a painting by Roland Diehl (then the LP was first released the white space with the artist's name in black letters was not there).